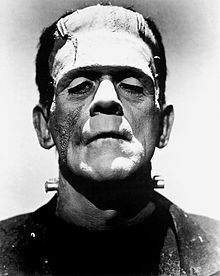 Frankenstein is a 1931 horror movie. It was directed by James Whale. It is based on the book Frankenstein by Mary Shelley. The movie stars Colin Clive, Mae Clarke, John Boles, and Boris Karloff. The movie was a great success with both audiences and critics. It was followed by multiple sequels, including The Bride of Frankenstein and The Son of Frankenstein. ↑ Box Office Information for Frankenstein. The Numbers. Retrieved April 13, 2012. This page was last changed on 5 April 2019, at 01:33.